I’m all about the comfort food these days. 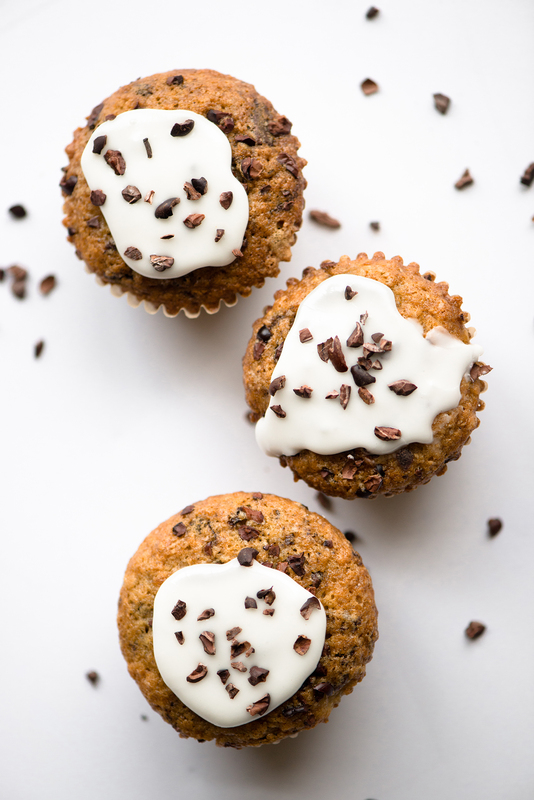 Being more than halfway through my pregnancy has me tired most days and craving comfort in warm bowls of soup, hot cups of soothing tea, and something quick and simple to bake up on weekend mornings. Recently, muffins have been my go-to quick bread craving and as spring fruits have yet to arrive I’ve been scouring my kitchen for ingredients to add to them. Happily, there were some very ripe bananas waiting to be used and there’s always plenty of chocolate and cacao nibs in my cupboard. 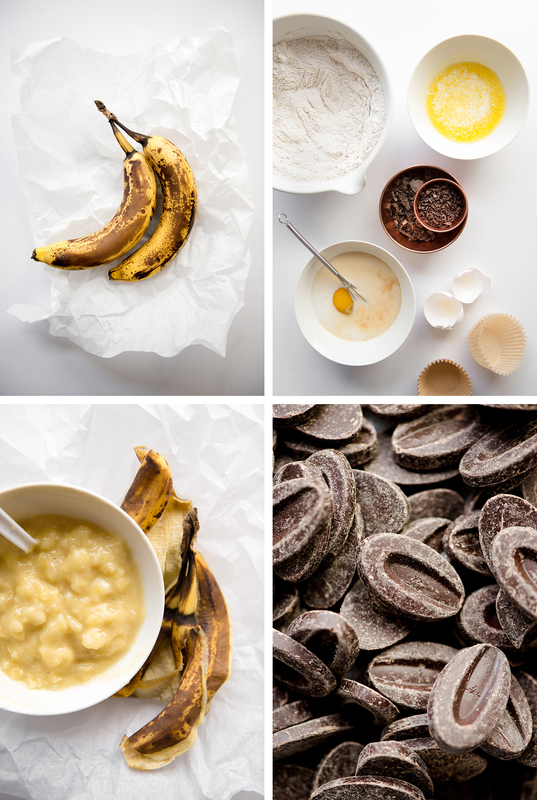 Bananas and chocolate make for an excellent combination and thus these Banana Chocolate Nib Muffins were born. I tend to be picky about muffins. They need to be moist, flavorful, and soft. A nicely domed top is preferred and if there’s a good dusting of crackly sugar topping that wins it some points too. 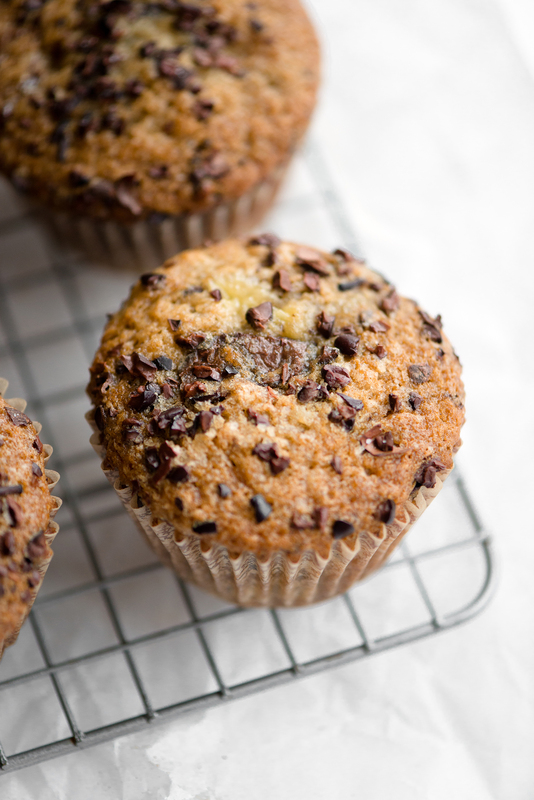 These Banana Chocolate Nib Muffins rack up all the points by hitting all these good spots. 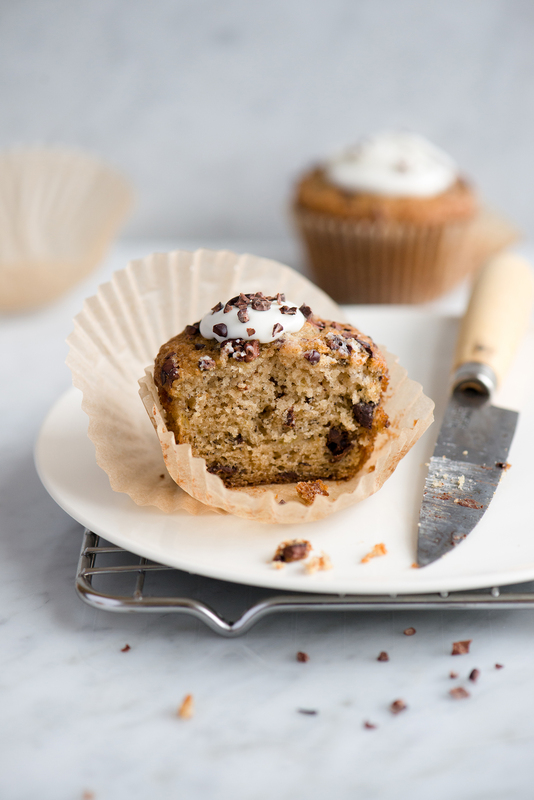 The overripe bananas create a very moist muffin texture (think of moist banana bread) with a light crumb. Folded into the batter are small chunks of dark chocolate that leave behind sweet pockets of melted chocolate after baking. Oh, and a sprinkling of cacao nibs and sugar for added crunch to the muffin tops. Not a big deal (it’s so good!). There’s also a glaze topping that can be added if you’re looking for a touch more indulgence. A few weeks ago I shared a photo of these Banana Chocolate Nib Muffins on my Instagram stories and asked the question: Do you like glaze on your muffins? The voting response was split 50% “yes” and 50% “no”. I can relate with both sides. Sometimes muffins are great with glaze and other times it’s too sweet. It ultimately depends on the type of muffin. In this case, the muffin glaze portion of this recipe is optional. These tender muffins are fantastic without glaze, but a touch of glaze does make them extra special without being overly sweet. It’s not a lot, just a dollop. Either way, it’s up to you. I ate them both ways and enjoyed every bite. *When making muffins it’s always important to not overmix the batter when stirring together the wet and dry ingredients. Overmixing increases gluten development (when the flour mixes with the wet ingredients) and the end result is a tough muffin after baking. Use a light hand when stirring the two together and just mix until there are no more flour streaks and everything looks nicely incorporated. * The muffin glaze portion of this recipe is optional. If you don’t care for glaze on your muffins, then skip it and enjoy the muffins still slightly warm from the oven with gooey pockets of melted dark chocolate. The sprinkle of sugar and cacao nibs give them a nice crust to bite into. Glaze or no glaze; both ways are delightful. Preheat the oven to 350F (180C). Line a standard 12-cup muffin pan with paper liners. In a large bowl, whisk together the flour, baking powder, baking soda, cinnamon, ginger, salt, and sugar. 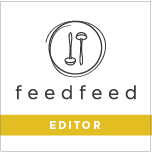 In a separate large bowl, mash the peeled bananas with a fork until mostly smooth. Add the egg, vanilla, and milk and whisk together until combined. Add the banana mixture and melted butter to the flour mixture and stir just until combined (don’t overmix the batter). Gently stir in the dark chocolate. Using a large ice cream or cookie-dough scoop, portion out the batter evenly among the 12 lined muffin cavities. 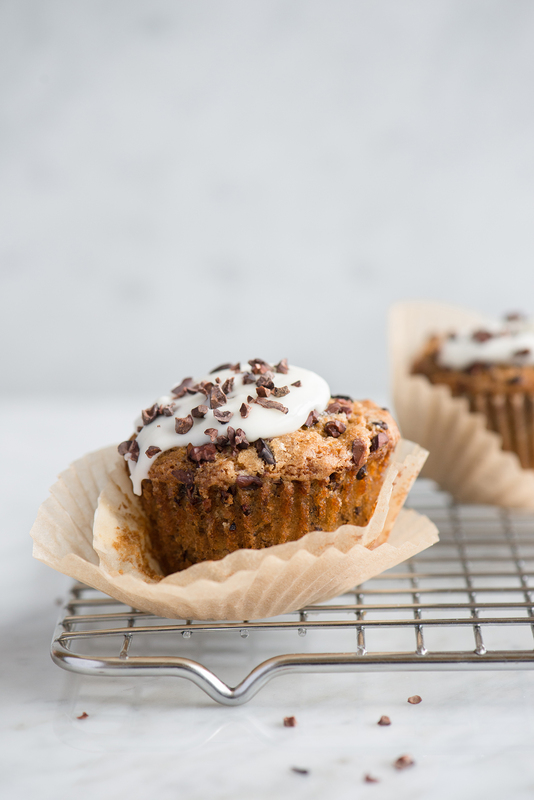 Sprinkle the tops of each muffin scoop with cacao nibs and a generous sprinkle of sugar (if using the muffin glaze you can skip the sugar sprinkle- or not). Bake the muffins for 25 minutes or until golden brown on top and a toothpick inserted in the center comes out clean. Set the muffins on a cooling rack and let cool. 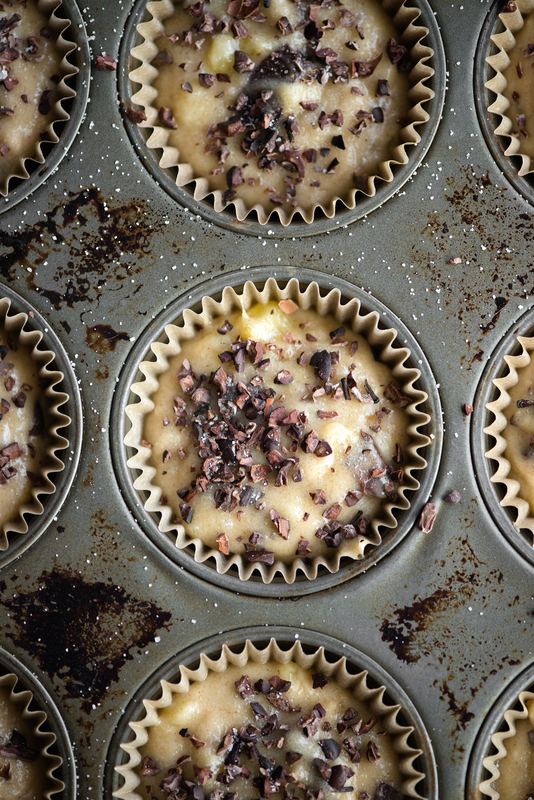 Once cool, dollop a spoonful of muffin glaze and lightly sprinkle with more cacao nibs. If not glazing the muffins, then enjoy the muffins while still slightly warm for the melted pockets of chocolate. Store unglazed cooled muffins, in an airtight container at room temperature, for up to 3 days. Sift the powdered sugar to remove any clumps. Add in the heavy cream and salt, then whisk until smooth. If glaze is too thick, add 1 tablespoon more of heavy cream at a time and mix until desired consistency. Such perfect muffins, I’m all about the glaze! These are delicious!! I love making them for my daughter’s class, not only are they easy to make but also so unique! !